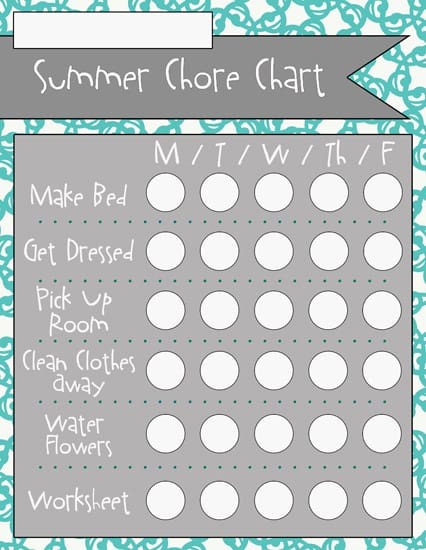 Nathan has outgrown my Pre-K Chore Charts over the last year, so I decided to make him a new Summer Chore Chart to use this summer. If this system works for him, then I’ll adapt it into a long term Chore System later in the summer that can be used all the time! 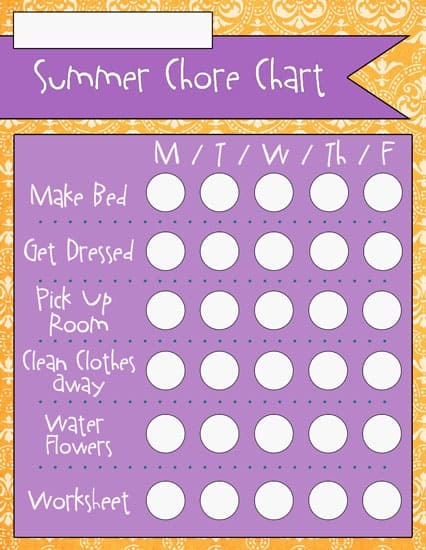 I also designed these fun Summer Fun Calendars to match this chore chart set! I’ve heard it’s a first born thing, but Nathan really likes to be involved and doing what I’m doing. Sometimes too much! He is pretty much capable of getting ready for the day and doings most things by himself, but the problem is he doesn’t WANT to do it by himself. He wants everything to be a family activity! haha 🙂 He’ll be 5 in a few months and come this Fall he’ll be starting morning Kindergarten and Jeffrey will be in morning preschool a couple days a week. I need Nathan to be able to just get himself all ready and his room picked up in the morning by himself, cause I’m going to have a baby and a preschooler to be getting fed and ready in the morning too! So, that is what I am going to have him focus on this summer – morning independence! I do plan on starting Jeffrey on the Pre-K Chore Charts this summer as well! He isn’t as naturally obedient as my Nathan was, but he is a lot more independent. 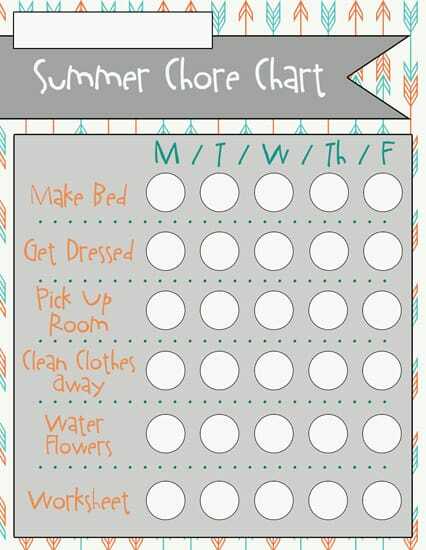 I’m starting this whole “chore” idea on him later then I did with Nathan, but now that he is 3 I’m thinking we can expect some good results from him! 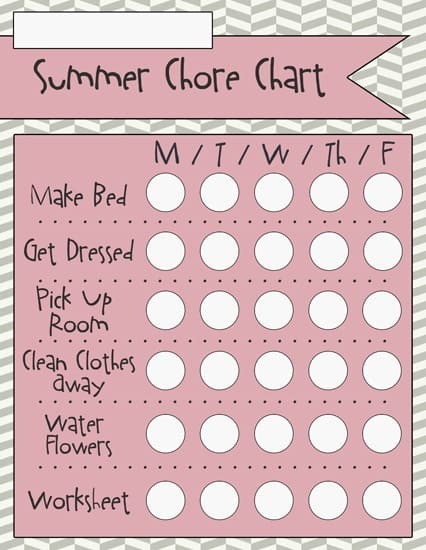 Hopefully, we’ll have a great summer of helping my boys create good habits of helping around the house! I created 6 design choices for you all! I am offering the file as JPG’s completed and blank. You can totally use the ones that I designed for Nathan or you can import the blank files into an editing program and customize it for your child. If you don’t have an editing program, then you can go to http://www.aviary.com/ and edit them there. It’s a really great and FREE site! The font I have used for my chore titles is LDJ Eccentric. You can download it HERE for $3. I actually got it from Lettering Delights one day when they were offering it for a limited time Free! Be sure to read THIS post on how to Use and Install Fonts if you don’t have experience with downloading fonts off the web. Now for the design choices and download links! I hope these can help your kids keep good habits in the summer in between all their non-stop play and fun! 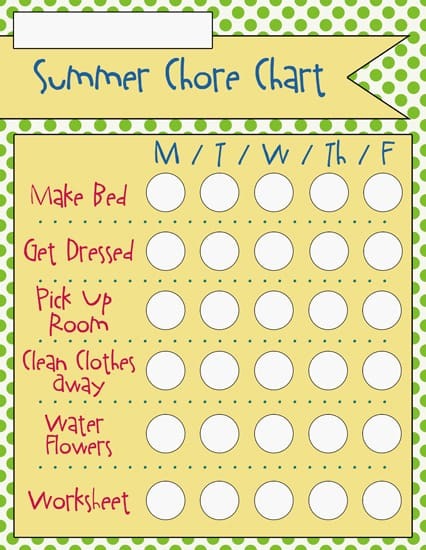 You may also be interested in looking at our: Mommy Chore Charts, Summer Reading Charts and Pre-K Chore Charts! Looking for things to do with your kids this summer? Check out our: 60 days of Summer Fun w/ Printable Cards, Summer Fun Calendars or What We Do in the Summertime Jar! Cute! I love all the different colors to choose from as well! Pinned! I’m also unable to get these to print. Any thoughts? Not sure what happened- I’ll get this post fixed today! Check back later this afternoon! Sorry about that Katey – the links are all fixed! Thanks! Thank you for these wonderful things! I love how you coordinated them with the summer to do weekly too! I am printing one (and laminating) for every member of my family. I don’t want us to get too out of our good habits during the summer. Thank you for sharing your talent with us! Blessings. P.S. I downloaded a bunch of wonderful stuff today. Thank you.